Naviance college profile pages recently underwent a redesign to make it easier for students to navigate the higher education maze when applying to college. The updated Naviance college profile pages provide personalized information and cater to students’ unique needs and preferences when looking at universities, all to help them decide if a school is a good fit. Here are three ways Naviance college profile pages help students find their best-fit college. New and prominently displayed data on Naviance college profiles ensures that students have the critical information they need to decide where to apply to college and that they don’t miss deadlines. 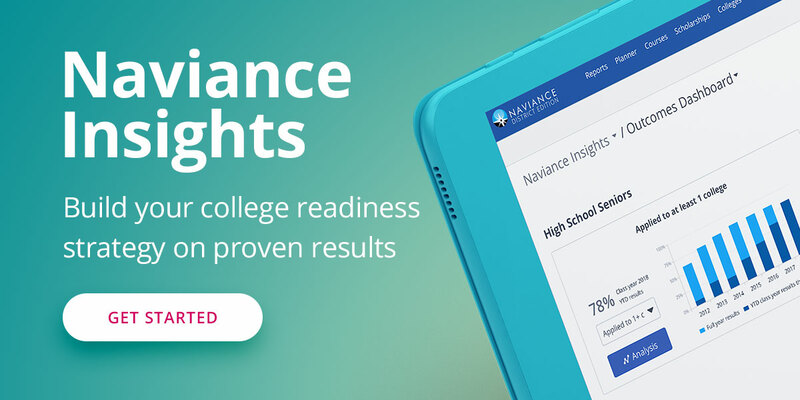 Naviance college profiles display information on schools’ acceptance, retention, and graduation rates; distance from students’ high school, and residential requirements at more than 4,000 U.S. and international institutions. The new profiles display also display critical financial details including the average total cost for universities based on students’ family income, average monthly loan repayment amount for alumni, and the average financial aid package delivered to students. Ever wonder what a college values in applicants? Now insight into how specific colleges weight different application factors is available to help students determine their likelihood of being admitted. Application factors include curriculum rigor, standardized test scores, GPA, extracurricular activities and other considerations. A fresh look for scattergrams provides tangible evidence based on GPA and SAT or ACT tests scores for how students compare to peers from their high school when applying to a college. It’s now easier than ever for students to connect with colleges through Naviance college profile pages. High school students can communicate directly with college admissions officers and request additional information about their institution. In addition to communication with colleges, high schools can activate ActiveMatch Events in Naviance to highlight university on-campus and regional events for students, and students can organize and register for events directly through Naviance. Naviance by Hobsons helps students find their best-fit educational and career path. Contact us today to learn more.